So, what exactly is sign painting? 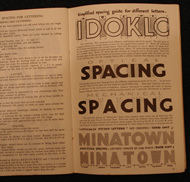 to create lettering, words, & symbols that provide visual messages to the public. Sign painting is freehand lettering of words and symbols with a brush and paint. It is control of the brush creating the letters. It is art & skill & dexterity… it is also design & layout, knowledge of a variety of fonts, making patterns, prepping boards, mixing paint, using shadows, outlines, highlights, borders, as well as centering, balance and correct spacing. Signs often announce a place’s identity or a person’s ownership… sometimes they are promotional, sometimes they are instructions such as directions or warnings. Everyone uses signs; there is a rich heritage for the traditional craft of sign painting. The use of signs has been around since ancient times, which is a very long history in the realm of artisan crafts… but this trade skill, like many others, has all but disappeared in the last 30 years due to modern technology. Historically, apprenticeships were the means of learning how to paint signs. Mastering the dexterity of painting with lettering brushes is the core skill of the learning process, but there are other associated skills and techniques required. Sign painting is rarely offered in schools any more, and it is difficult to get training due to lack of demand. Instructional books are available. The old fashioned sign painters are hard to find and even if you find someone with the skills, many refuse to pick up a brush anymore. But there are some sign painters that are still passionate about the work and will offer to share knowledge and skill to those interested. 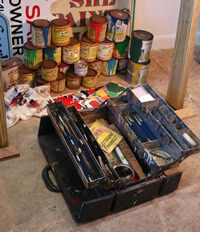 The internet is a good place to search for working sign painters and enthusiasts. Until the 1980’s, all outdoor visual communication was done by a person who painted it by hand. Hand painting was once the only way to put advertisement on buildings, walls, windows, and vehicles. For the one of a kind sign jobs, storefront signs, truck lettering, and show-card signs, the company of choice was called a “commercial sign shop.” Commercial shops specialized in all types of individual jobs as opposed to mass production runs. Silk screening was the main form of mass production before computer-generated signs. The custom ordered, unique, one of a kind signs are still desirable in some wealthy communities where high quality hand crafted items are still appreciated. They are also still desirable for authenticity purposes, such as historic house markers. At the other end of the spectrum, hand lettered signs show up in poor neighborhoods where they are an economic necessity, or as artistic graffiti expression of ethnic pride. 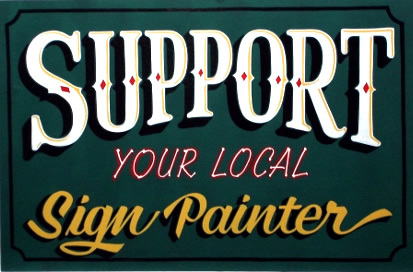 Many people still enjoy things that are hand crafted and authentic, and that’s exactly what sign painting is. The word just has to spread that sign painting is still alive and people are still doing it. Between the two economic extremes, new sign companies prefer vinyl plotters since they offer a faster turn around and require less talent and skill to process sign orders… So, “sign technicians” with squeegees churn out boring uniform stick-on vinyl lettered signs for the mass market and the general public is oblivious to the differences. Vinyl has its advantages. There are even vinyl fonts that are designed to fake resemblance to hand painted lettering… but it can never look the same. Since traditional sign painting has nearly disappeared, the cost of traditional sign painting supplies has greatly increased… classic rules of supply and demand unfortunately. MDO plywood (Medium Density Overlay) in 4x8 sheets was the sign industry mainstay, used as background material for most signs for many years. MDO has become exorbitantly priced and is now a hard to find specialty item at a few large lumber yards and large sign supply businesses. Oil based One Shot Lettering Enamel, the favorite sign lettering paint for many years is also hard to find and expensive. 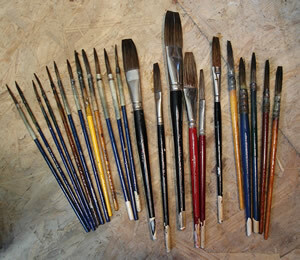 Lettering brushes, quills, flats and liners are often made from grey squirrel hair and they are hard to find and expensive. New materials such as corrugated plastics, hard plastics, aluminum sheeting, synthetic foam materials, and sandwiched materials have taken over in the sign industry and are now commonly used as the substrates for vinyl lettering and computer generated signs. Acrylic and vinyl based paints are gaining preference over oil based paints and there are even new lines of water-based lettering paint. The new materials are progressive and have many advantages, but they are not necessarily useful as supplies for the traditional art of sign painting. A side note in praise of hand painted signs is that there’s a new growing market and appreciation for antique hand lettered signs. Collectors appreciate the skill required, as well as the craftsmanship and artistry represented by the artisan sign industry that was before the computer age. Honoring the talent of generations past and the reviving interest for vintage hand painted signs will hopefully encourage interest in more new signs that are painted by hand. Beautiful vintage signs can bring high prices. The naturally aged, colorful, antique signs with their eclectic designs will live on as collectible artwork and decoration. The nostalgia factor can’t be ignored either with old signs; people love to collect advertisements and brand names that remind them of the past. There are always the bad guys though, and dishonest people trying to cash in… fake vintage signs are plentiful but the distressed reproductions altered with smoke, acids and chemicals can be easily identified by careful observers. Sign painting can survive as ‘typography based art’ too. Recently a California art gallery showcased current sign painting work being done in San Francisco. There is an excellent film documentary, “Sign Painters,” which was released in 2013. The movie helps prompt new interest in hand lettered signs. No one can deny the character of a well executed hand painted sign. Evidence of being created by the human hand is clearly visible and it is desirable… Some signs just look better hand painted. Hopefully the skill will not be completely lost. Let me know how I can apply my expertise to your sign project. Feel free to Contact me.